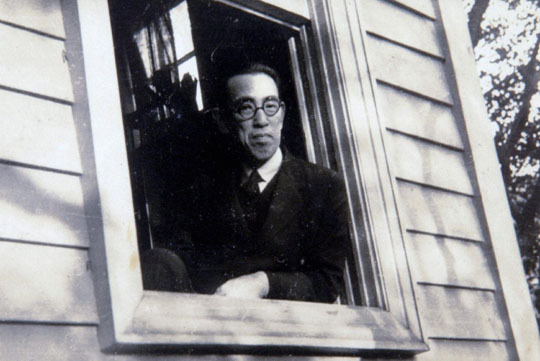 The Muromachi section of the book is a bit tiresome, too: to don monk’s robes and travel up and down the country, visiting famous places and composing poetry at each, seems to have been a major career avenue in the age; why did everyone of those lives deserve being recorded in a literary diary, liberally sprinkled with poems and the usual reflections on the impermanence of things baffles the mind. Why they deserve reading or discussing — even more so. But there are real gems here: I have mentioned the Mother of Jojin already. 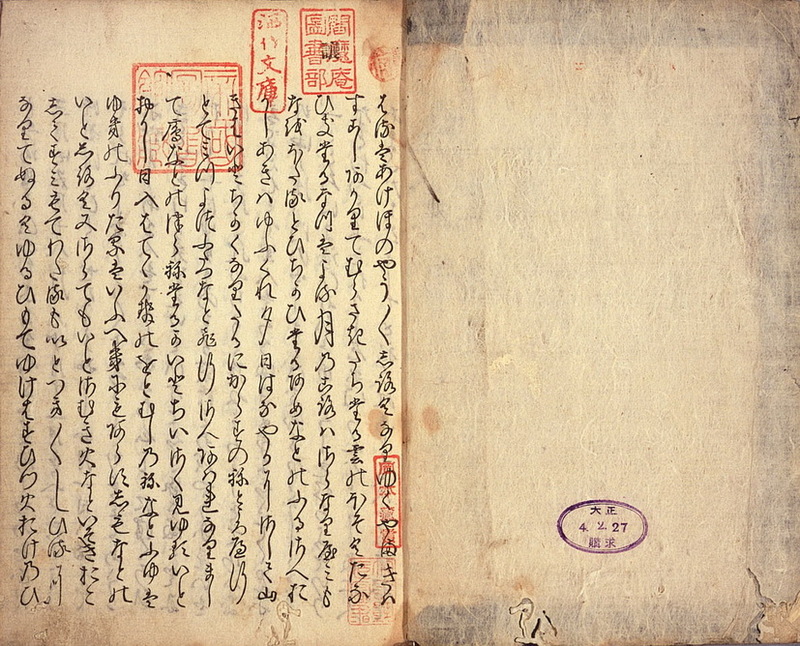 Diaries have often survived in sets: for instance, there is one by Fujiwara no Teika (1162-1241, Chronicle of the Bright Moon) in which the famous poet reports mostly on his quarrel with Emperor Gotoba — a competitor poet and co-editor of the Shin-Kokinshu collection of poetry — over, essentially, who was the greater of the two. It’s all dreadfully petty: I knew men just like the two of them when I worked in a large corporation in Tokyo. 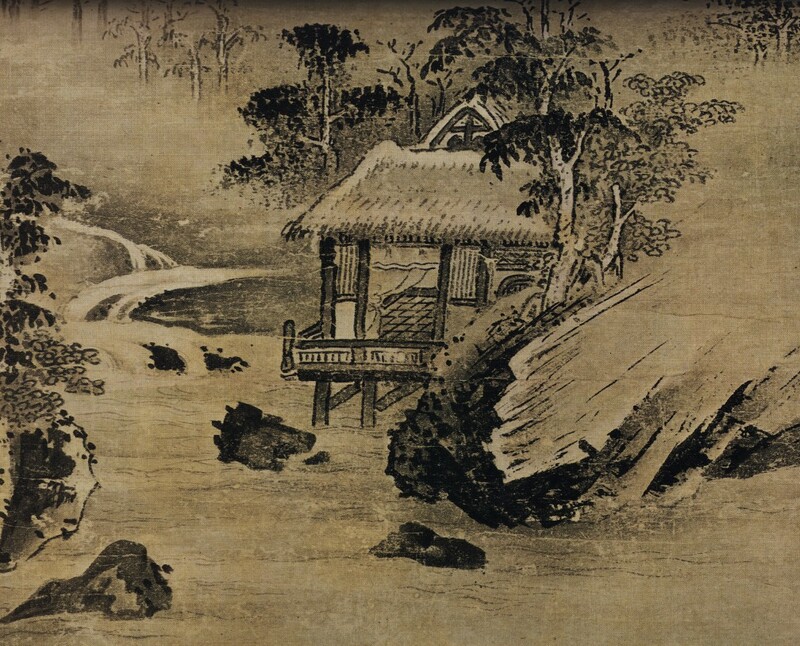 Yawn, skip over and — boom — suddenly you come upon Utatane — Fitful Slumbers — a memoir rather than a diary, in which a young woman (Abutsu) disappointed in love describes her spur-of-the-moment departure, in the middle of a rainy night, from her family home to enter a nunnery; she cuts off her hair, writes a poem — it has some reference to Ono no Komachi’s “floating weeds” — looks at it, shakes her had in amazement, asking herself: “Is this supposed to be about drowning?” and sets out into the night. It’s cold and raining, she loses her way in a forest, at dawn meets some country women who aid her, chattering to her in a language she barely understands — the dialect of the lower classes. Abutsu’s a gutsy girl and we’re not really surprised to find out that she doesn’t last long in the nunnery. We are surprised to learn, however, that she lived on to marry none other but the old windbag Fujiwara-no-Teika, in what was, incredibly, an apparently happy union. (Teika had some hidden virtues, no doubt). The very next diary discussed in the book is one of Asukai Masaari, a footballer, no less (his high esteem at court was based on his great skill at the game of kemari), a physical type, who apologizes for writing in Japanese (Chinese having been regarded the proper medium for men), and explains why it is OK, or even preferable, though we soon realize it’s probably all an excuse: he probably couldn’t have written in Chinese his way out of a paper bag. I have known Masaari’s type, too, and though it wasn’t my type, I liked it well enough: his diary is basically one long record of this party and that party, this prank and that prank, and, of course, plenty of dancing girls — and then some. And then, in another surprising twist, we learn with surprise that Masaari studied literature with… none other than Abutsu, now Teika’s wife. The study consisted of her reading to him the Genji Monogatari for hours on end. The effort seems touching, somewhat chimeric, but, given Abutsu’s personality, it probably wasn’t much of a chore. (What she saw in Masaari is more puzzling, unless it was — the usual). 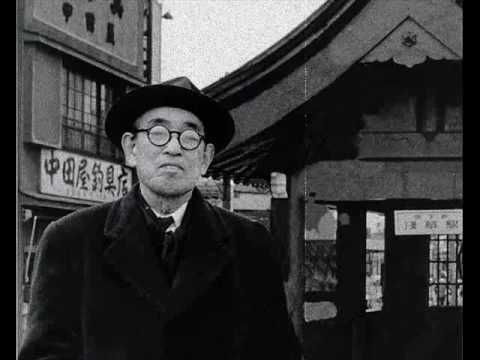 And then there is The Journey Along the Seacoast Road, a record of a long trip from Kyoto to Tokyo, of an older man who sets out in order to see the Eastern capital for himself as much as to get away from his tiresome mother; he writes poetically, in a difficult language, a mixture of Japanese and classical Chinese, and it all seems rather literary until we come upon a strange tale: on a pillar of an inn in “Kikugawa” (“Chrysanthemum River”), the author discovers a poem inscribed several years earlier by Middle Counselor Muneyuki who’d been captured in the wake of the Jokyu rebellion and passed through here led on his way to the place of his execution. Kikusui — “chrysanthemum water” — said the Chinese, was supposed to prolong life; but his own was here about to end, his cut off head falling to the ground like a chrysanthemum blossom. It all seems about one thing and then comes a sudden switch and it turns out to be about something altogether different. The Jokyu rebellion, by the way, was raised in an effort to return Emperor Gotoba back to power, a stuffy, unlikeable man, as we have already learned from Teika. Muneyuki should have kept his head. Stuck to the game of kemari, like his footballer friend.